If you ask anyone to recount their stories of reading books as a child, chances are they’ll mention Roald Dahl. I mean, everyone’s read at least one of his books. But there’s always been one in particular that has captured the hearts of literary lovers far and wide; The BFG of course. A kind and gentle giant with superhuman hearing abilities and a heart of gold makes friends with an unlikely ten year old girl, Sophie, and the pair work together to convince the Queen to banish the Bloodbottler’s, Fleshlumpeater’s and other mischievous giants once and for all. But it’s not just the story that’s captured the hearts of readers far and wide, it’s also the illustrations within Dahl’s books. For over 20 years, Roald Dahl and illustrator Quentin Blake worked together like a dream team, the creative partnership truly harmonious and together they brought to life some of fictions most memorable characters. The Bowes Museum, well known for its art galleries, is hosting the enchanting ‘BFG In Pictures’ touring exhibition from the House of Illustration, the UK’s centre for the art of illustration whereby unpublished illustrations, curated by Quentin Blake and featuring 40 of his original artworks, are being exhibited for the first time alongside the final illustrations for the book. 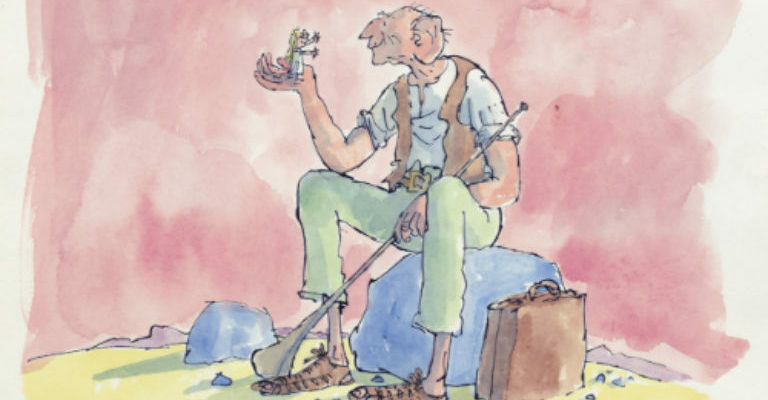 The exhibition includes some of the first designs for the character providing a fascinating insight into the collaboration between author and illustrator, and gives readers a glimpse of a BFG that might have been. As well as the pictorial exhibit, children can make dream catchers to catch bad ‘trogglehumpers’, they can also make puppets and dream horns and work collaboratively to make a large 3D model street complete with a big friendly giant in a series of drop in sessions for children. The lively activity programme takes place in the BFG’s cave that’s packed full of activities, a comfy reading nook and dress-up boxes – complete with some huge ears that the husband and I may have worn to take a very comical selfie! The exhibition, which runs until September 30 2018, is not to be missed and is perfect for all ages. I took the husband and our two children and we had a wonderful time making the dreamcatchers surrounded by the illustrations. As we entered the museum, we were also given a BFG woodland trail map, which we sadly didn’t have time to do all of, but the great thing is you can go back and do it whenever you like. The Bowes Museum has such pretty grounds outside that it’s fun to wander and let the kids play on the wooden play trail and see the tall chainsaw carved BFG at the front of the grounds. It was a really good day out, especially as we popped into the fashion exhibition which is on at the museum too and if you feel peckish whilst you’re there, you can even get a special BFG themed afternoon tea.